+ Thank you ‘edarlitrix’ for the article idea. God bless you, friend. Is joy compatible with sorrow? If joy is not felt, can it be called joy? How can suffering and joy coexist? How do we attain purity of heart/intention? Joy can be described as spiritual contentment, resulting from the possession of a desired good. Authentic joy consists in the possession of God, Who alone can satisfy our hearts, which thirst for Infinite Truth (satisfaction of the intellect) and Infinite Love (satisfaction of the will). Our hearts were made by God and for God, the Sovereign Good. Only in Heaven will our joy be complete: ‘Enter into the joy of thy Lord.’ (Matthew 25:21). There, the risen body will partake of the soul’s delights, without hindrance. Also, according to sound theology, the risen body will have its own unique delights. St. Thomas answers in the affirmative (ST, Second Part of Second Part, Q. 28, Article 2). In this “valley of tears”, our joys are often mingled with sorrow. As we grow in love, we also become more sensitive to sin, which abounds in the world. The sight of our loved ones suffering is enough to render our joy imperfect. Yes, for if we return to the definition of joy (i.e. “spiritual contentment, resulting from the possession of a desired good”) and to St. Thomas, we will see that joy does not properly consist in feelings. It is quite possible to experience intense fear and joy at the same time, for example. As it is not a physical thing, joy cannot be reduced to a feeling or an emotion. In saying that, joy does imply peace and contentment – at least at the spiritual or intellectual level. To understand what this means, we must distinguish between the inferior part of the soul and the superior. The superior part of the soul, in simple terms, refers to the spirit, whereby man is distinct from the animals. Man can know and love – these are spiritual faculties. The inferior part of the soul, in simple terms, refers to our emotions. It is possible for the superior part of the soul to possess joy, while the inferior part of the soul is beset by all kinds of trouble, such as fear, restlessness and violent movements of the passions (e.g. anger). It is a fact that many of the Saints suffered indescribably. It is also a fact that many – if not all – of the Saints were full of peace and joy. 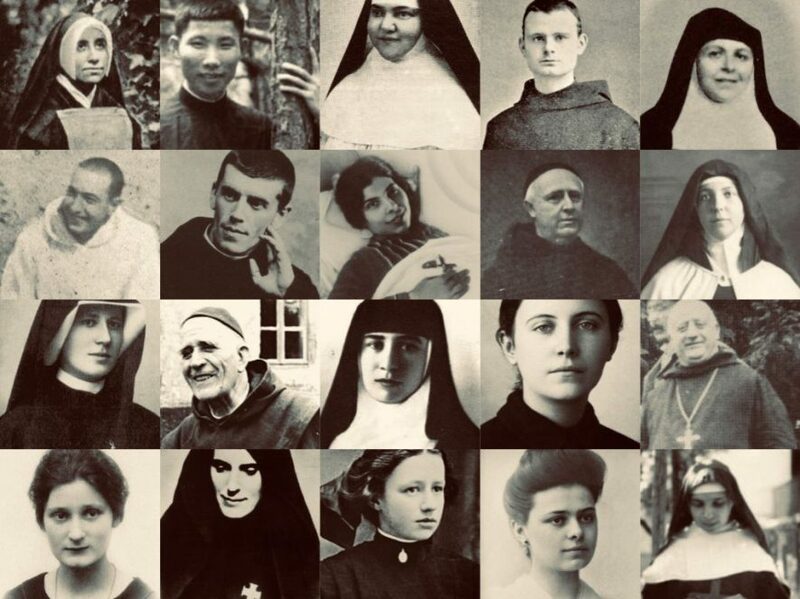 “To suffer for God is the highest joy and delight,” says St. Crescentia; “but not to be able to love Him enough is a great martyrdom.” “When suffering is accepted with love,” says St. Therese, “it is no longer suffering, but it is changed into joy.” Such expressions are not uncommon amongst the Saints. In his personal diary, for Christmas Day, Bl. Dom Marmion writes: “Aridity and temptations. Deo gratias (Thanks be to God).” This same holy Abbot – an astounding theologian, whose doctrine is very practical and consoling – writes: “In finding God, we shall likewise possess joy… It is impossible to explain the abundance of this peace in the soul altogether given to God and seeking Him alone.” These are the words of a man who underwent long interior trials, and who experienced bouts of depression. But these sufferings have ended for him, and they shall never again touch him; for he is now experiencing unimaginable happiness ‘in sinu Patris’ – in the Bosom of the Father (Jn. 1:18). When we suffer, let us not forget this: the Cross, borne willingly, unites us more intimately to God, and leads to Paradise. We might wonder how anyone could maintain joy amidst terrible suffering. The answer is simple: by LOVE. (A supernatural love, that is). Love alone will transform our very sufferings into joy. The greater the flame of Divine Love that burns in our hearts, the more rapidly will the wood of the Cross be consumed, thereby producing an ardent and pure charity – a delightful charity that is incomparably sweet; a charity that increases our knowledge of God (God is both Love and Light); a charity that gives us strength (God is both Love and Power); a charity that draws down an abundance of grace; a charity that increases our confidence in God’s love and in the hope of an eternal reward; a charity that renders our trials light and sweet; a charity that increasingly finds its pleasure in pleasing God. And because God is infinite Love, we can always love Him more (Fr. Paul of Moll). Consequently, there is no limit to the joy that God offers us! Even the smallest suffering accepted for the love of God, increases our union with Him. And what more could the Saints desire – or can we desire – than God? What more can we hope for than the love, the friendship, the protection, and the grace of God? “The good of the grace of one soul,” writes St. Thomas Aquinas, “is greater than the good of the nature of the whole universe.” “Do you not actually possess all things if you have Him who possesses all?” (Peter de Blois). The joy of the Saints, you see, was a result of their pure love for God. They desired God alone. Because they had given themselves to Him entirely, they were assured of His love, His grace and His protection. ‘I love them that love me: and they that in the morning early watch for me, shall find me.’ (Prov. 8:17) The joy of the Saints was constant because they were ever seeking God. ‘To those who love God, all things work together unto good’ (Rom. 8:28). The more generous we are with God, the more generous He is with us. If we are all His, He is all ours! “My child,” said the Infant Jesus to St. Crescentia, “give Me thy heart, and everything that I possess is thine.” He repeats these same words to us: ‘My son, give me thy heart: and let thy eyes keep my ways’ (Proverbs 23:26). Persevering prayer is the key to purity of heart. Constant, confident prayer obtains all. Without confidence, there can be no joy. ‘Let thy mercy, O Lord, be upon us, as we have hoped in thee.’ (Ps. 33:22) Without prayer, we can accomplish nothing. How can we draw closer to God if we refuse prayer, which is the key to His grace and mercy? Let us pray, then, with unshakeable confidence! As soon as our soul is touched by grace, let us hasten to the Sacred Heart of Jesus, which is an abyss of love and mercy. Do not think that any hardness of heart is an obstacle to God’s mercy; if it were, He would not inspire us to seek Him. Our greatest obstacle to union with God, apart from self–seeking, is a lack of confidence in His goodness. “Only that which is eternal can satisfy us.” (St. Therese). Created goods cannot satisfy us; they were made for us, not we for them (as God said to St. Catherine of Siena). Likewise, human love cannot satisfy our hearts. Only God can satisfy our hearts. He is the cause of every good that we see in the world; He is the Eternal Fountain from which pours forth every good. ‘Every best gift, and every perfect gift, is from above, coming down from the Father of lights, with whom there is no change, nor shadow of alteration’ (Jn. 1:17). Consider that all the love, knowledge and joy of the Elect is merely a participation in the limitless abyss of God’s love! All of these things can be found in Jesus to an infinite degree. We have every reason to be generous with God, and not a single good reason to be selfish. Let us pray frequently, receive the Sacraments devoutly, and ‘attend unto [spiritual] reading’ (1 Tim. 4:13). When we die, we will have to account for all the graces that we have abused. How little do we esteem grace! ‘He that spared not even his own Son, but delivered Him up for us all, how hath He not also, with Him, given us all things?’ (Rm. 8:32). How admirably are these words fulfilled in the Holy Eucharist! If we seek joy, there we shall find it! The Eucharist is truly the Risen Christ; veiled under the appearance of bread and wine is He Who said to St. Thomas: “Put in thy finger hither, and see my hands; and bring hither thy hand, and put it into my side; and be not faithless, but believing.” (Jn. 20:27) The Adorable Eucharist is the Ultimate Source of Strength and Holiness. What does the following Bible passage mean: ‘Extinguish not the spirit’(1 Thess. 5:19)? Fr. Haydock writes: “Do not oppose either the interior gifts of the holy Spirit, which are his graces, nor his exterior gifts of prophecy…” We do this by setting up obstacles in our souls: pride, disobedience, distrust and the like. This admonition is not referring to souls of good–will; if they trust in God and continue to ‘seek first the Kingdom,’ God will fill them with His peace in time. The feelings of our sensitive nature (to be understood in a Thomistic sense) are not necessarily an indicator of our interior dispositions, nor are they a good guide to the spiritual life. On the contrary, God wants to perfect our joy by perfecting our charity; and this transformation can only be effected by means of the crucible of suffering, which purifies, enlightens and strengthens. Why is there so much sorrow in the world? How can I infallibly attain peace? Be little. “I want you in My arms,” said Jesus to Bl. Alexandrina (a bedridden stigmatic), “with the same simplicity of a baby in those of its mother.” “Give up your own will,” as Our Lady said to St. Bridget, and seek only God’s good–pleasure. He will remove any obstacles to your peace; but this will happen in God’s good timing. Believe me. I used to be consumed by sorrow; but I kept asking God for light, and He heard my wavering prayers in a miraculous manner. Deo gratias! Are there any good online resources on joy? There are two that spring to mind. The first deals indirectly with joy in so far as it gives us reasons to believe in the immense goodness of God. The second is very beautiful. I happened to “stumble upon” this chapter while at Eucharistic Adoration. This was quite fitting, as it relates perfectly to what has been said in this article. It is a very encouraging read. St. Mechtilde believed that Our Lord said to her that the number of Catholics who go to Heaven when they die, exceeds the number of those who go to Hell (Liber specialis gratiae. In Sanctae Mechtildis, virginis ordinis sancti Benedicti, Liber specialis gratiae accedit sororis Mechtildis ejusdem ordinis Lux divinitatis. Book 6, Chapter 15. Ed. Monks of Solesmes. Paris: Oudin, 1877). Nevertheless, Our Lord assured her that His justice will claim its due; many souls will go to Purgatory before they are pure enough to enter the Kingdom of God. Whether or not we can apply this revelation to every generation is not certain (private revelations, in themselves, are uncertain*). It may be the case that the majority of Catholics will, in the end, be saved. Either way, let us thank God for His mercy! And let us not be presumptuous! We will be saved if we seek God with all our heart. If we are tepid in our faith, there is a danger that we will fall from sin to sin, without even realising how far we have fallen. We must imitate the holy monk that St. Leonard tells us about, who said that, even if one soul were damned, he would do absolutely everything in his power not to be that soul. *Still, if they are consistent with Church teaching, and if they have been given to a humble and obedient soul, such as St. Mechtilde, then we are safe in believing them, so long as we subordinate them to the Magisterium… This site only quotes from the revelations of those whose virtue has been recognised by reputable authorities. “Write, my Benigna, Apostle of my Mercy, write this: The principal thing I desire to make known is that I am all Love; the greatest pain souls can give Me is to doubt My goodness. Not only does My Heart feel compassion, but It rejoices when there is much to repair, provided souls have no malice. If thou couldst know how powerfully I would operate in a soul, even filled with miseries, if she would let Me! Love has need of nothing, but it must find no resistance. Often all that is required of a soul to render it holy, is to let Me act. Imperfections cannot displease Me, unless the soul loves them. She should use them as so many steps of the ladder to mount to Me by means of humility, confidence and love; I descend to the soul that humbles herself, and go to seek her in her nothingness to unite Myself to her. … It is certain that a hundred sins offend Me more than one alone; but if this single sin is distrust of Me, it wounds My Heart more than the hundred others, because distrust wounds My Heart to its innermost core. I love men so much! “Yes, they have too narrow an idea of the goodness of God, of His mercy, His love for His creatures. They measure God by creatures, and God has no limits; His goodness is without bounds. O that men are able to use God and will not do it! Why is this? Because the world knows Him not. I am an infinite treasure which My Father has placed at the disposal of all. They who reject Me will comprehend their misfortune only in Eternity. I love men; I love them tenderly as My dear brethren; although there is an infinite distance between them and Me, I make no account of it. This article consists of a fairly lengthy response I made to someone on Catholic Answers, concerning the justice of God. I am responding to a number of assertions, such as that God cannot be good or powerful if, desiring the salvation of all, all are not saved. 3. Suppose that all were saved but one. Suppose also that this person was “Adam.” Would it be just if God removed Adam from existence, if He knew that, by removing him, his descendants would likewise be removed? There are a number of responses to a hypothetical scenario such as this one, but ultimately they rely on assumptions: we do not know what the just or morally better alternatives are. Reason alone cannot provide the answer. 5. Hell is a fitting punishment. God is offended by sin; God is infinite; therefore sin is of infinite malice. A holy soul once said to Our Lord: “Lord, I submit to Thy judgements, but do not push the rigours of Thy justice so far.” Our Lord replied: “Do you understand what sin is? …” “I understand, Lord, that sin is an outrage to Thy Majesty.” “Well, measure, if you can, the greatness of this outrage.” “Lord, this outrage is infinite, since it attacks infinite Majesty.” “Must it not, then, be punished by an infinite chastisement? Now, as the punishment could not be infinite in its intensity, justice demands that it be so at least in its duration.” St. Catherine of Genoa and other Saints and theologians say that the pains of Hell are actually much less than they could justly be. God shows mercy even to the damned. We must also remember that the pains of the damned are proportionate to their sins. The fires of Hell, says St. John Chrysostom, discriminate between sinners. 6. According to St. Thomas, God cannot suffer at the loss of souls, in so far as He is Divine; but this does not mean that God is unloving, cold or apathetic. We often equate emotion with the heart, but the fact is that the Word (Jesus), had as much love for souls prior to the Incarnation (even though He could not then suffer at their loss), as He did at the moment of, and subsequent to, the Incarnation. (I say “at the moment of” because some mystics believe that Jesus suffered from birth.) We know that Jesus suffered intensely at the loss of souls. Consider that Jesus wept; consider His sufferings in the Garden of Gethsemane. Furthermore, many holy souls (e.g. St. Faustina, St. Catherine of Racconigi, Ven. Anne of St. Bartholomew) say that Our Lord suffered inexpressibly at the loss of souls. Others (e.g. St. Bridget, Bl. Battista Varani) add that Our Lord would willingly, if it were possible (i.e. in accordance with His justice) suffer again everything that He suffered to save evenone of the damned! What love! These are great mysteries, indeed, but they are mysteries that should fill us with confidence rather than doubt. 8. If Jesus is God, then any mystery pertaining to our salvation should be seen in the light of revealed truth. Scripture says, for example: ‘Thou art just, O Lord: and thy judgement is right.’ (Ps. 119: 137). We may doubt this if we wish, preferring to trust in our own intellect, but ultimately we have no good reason to do so – especially considering that our reason is only a reliable source if God, Who created our intellects, is true. 9. In relation to the small number of the Elect, we must remember that this is not dogma. While it seems very likely that a relatively small number are saved (out of the total of mankind), this does not tell us how many are damned. The large number of unbaptized children, for example, who die every day are not included in the number of those who are damned, properly speaking. The Council of Florence says that unbaptized infants go to Hell, but – and this cannot be emphasised enough – the Church is here referring to the loss of the Beatific Vision; for the Church elsewhere teaches that only those who die in mortal sin go to the Hell of the damned. (I do not wish to discuss the exact or ultimate fate of these souls. Ultimately, God is all-good either way; at the very least, these souls will experience a state of natural happiness, as St. Thomas, St. Alphonsus and many others have explained). “I want you to set fire to the world with this love of my Divine Heart, today extinguished in men’s hearts. Set fire! Set fire! I want to give my love to all men. I want to be loved by all.